Design Options link will open in new window. These classic, movie theater-style popcorn boxes made from heavyweight paper will put the mom to be at the top of the playbill! 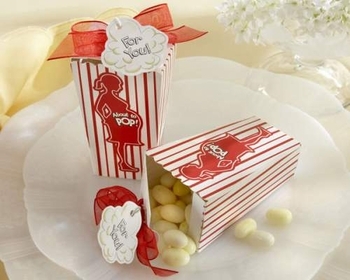 These whimsical party favors can be filled with mints, nuts or even popcorn kernels for a truly authentic touch. The minimum order is 48 items (2 sets). Optional personalized tags with name and date of shower are available for only 40� each. Please note that tags arrive unattached. Some assembly is required. Personalized items require five business days for processing.